I have been using f.lux for years- it works well but I have been considering to replace it with an alternative for a couple of reasons- it is not portable (and doesn't install in a desired location to boot) and its update prompts are extrenely annoing- as far as I know update check cannot be disabled. 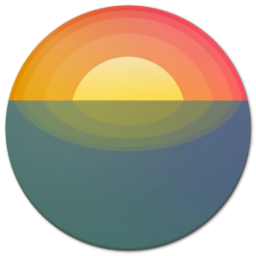 Two days ago I finally found time to test an open source and portable alternative- Redshift Tray, and since it behaves well I think I will dump f.lux for good. Redshift Tray is a no-frills GUI for the excellent screen temperature adjustment tool Redshift by Jon Lund Steffensen. If you'd like Redshift Tray to automatically run at startup, right-click the tray icon again and click Autorun under Settings, so that this option is checked. 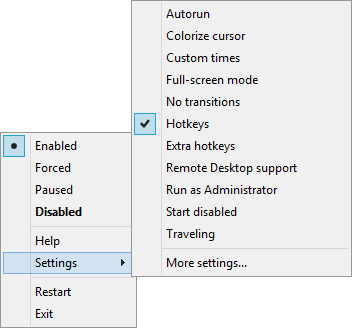 This setting just creates or removes a value in the registry key HKCU\Software\Microsoft\Windows\CurrentVersion\Run. I presume that Redshift Tray should run under Windows XP or higher. Redshift Tray is licensed under GNU General Public License v3.0. Redshift Tray is in active development- the latest version (as of 2018-06-16)- 1.6.4, was released on 2018-06-13. Redshift Tray is lighter than f.lux- under Windows 8 x64 Redshift Tray version 1.6.4 uses about 10 MB of RAM while f.lux version 3.10 uses about 24 MB of RAM. Redshift Tray is written in AutoHotkey. Redshift Tray uses ipapi service for coordinates. There is a different program with exactly the same name- Redshift Tray, which I have not tested. AlternativeTo erroneously mixes these two programs (icon of ltGuillaume - Redshift Tray, website and screens of Nepochal - Redshift Tray). Great find. At first I wasn't too enthusiastic because of the missing GUI settings dialog. But on a second look I found the ini-file very straightforward and easy to access (More settings ...). I like to have full control over my color temperature, able to tweak it manually, anytime, irrespective of day/nighttime settings. Thanks to forced mode and hotkeys this is easy to achieve: tooltip popups indicate current values - no need for sliders like in SunsetScreen. It's important to turn it off when doing photo work - to avoid corrections based on wrong color information. When starting up image editors I have AutoHotkey bring up a warning reminder so I don't forget to switch it off. Now with Redshift, I might take this one step further: Redshift Tray comes with its ahk-source file - this probably allows adding a group of apps and provide them with their own (neutral) values. The previous version of Redshift Tray - 1.6.5, was deleted and cannot be downloaded. Keep Windows calibration: prevent Redshift from messing up custom calibration or ICC profiles with "-x"